Freelancers can’t read your mind. CLIENT: I said I wanted the car to be sleeker, but it looks like you just made it rounder. FREELANCER: Right, I figured that would make it more aerodynamic. You did say “streamlined” when we talked over the phone. CLIENT: Yeah, but I meant streamlined as in, more like a rocket. FREELANCER: I can make the car narrower, if you like. CLIENT: No, it should stay the same width, I just want it more rocket-shaped. FREELANCER: So you want the car to be pointier? If you find this happening a lot, consider taking a step back and making some diagrams. Yes, they’re time-consuming to make, and you may feel like you shouldn’t have to spell things out for professionals who take art direction for a living. But you’ll find that diagrams will actually save you time in the long run. Your revisions will get turned around faster and more accurately. It’s no mystery, really—your freelancers work visually. A diagram provides them with instructions in their native language. Take the Scorpion Rider, for example. 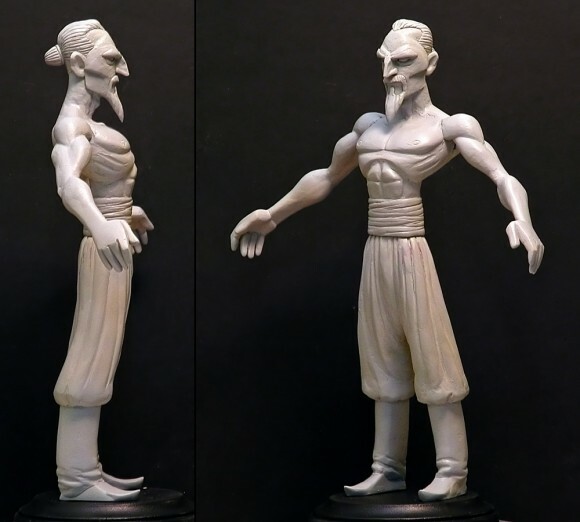 Our art director had previously sculpted a maquette illustrating the changes he wanted to see made to the existing 3D model. You’d think no further reference materials would be necessary, but that’s where we get back to mind-reading. A sculpture is still just a tool. We still needed to explain what it meant. The modeling went well overall, but arms and hands are notoriously difficult to sculpt in any medium. We were getting close to what we wanted, but we weren’t all the way there yet. 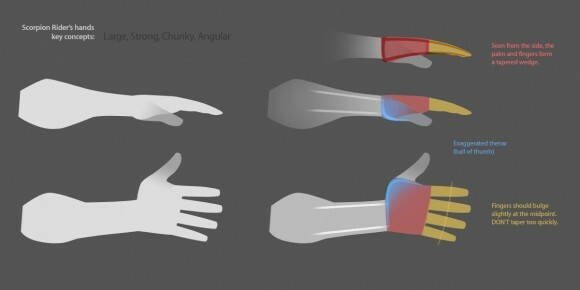 To spare ourselves a lot of back-and-forth over the intended meanings of “cadaverous,” “sinewy,” “boxy” or “muscle definition,” the art director made the pair of diagrams below. These diagrams are much more than just detailed views of the maquette. The maquette shows the modeler what to do. The diagrams show how. It’s a critical distinction, and for a freelancer, probably the next best thing to telepathy. The last stage of the process was the above diagram from the art director, showing the invisible lines formed by the Scorpion’s proportions. It was vitally important that these proportions be preserved when bringing all the components together. 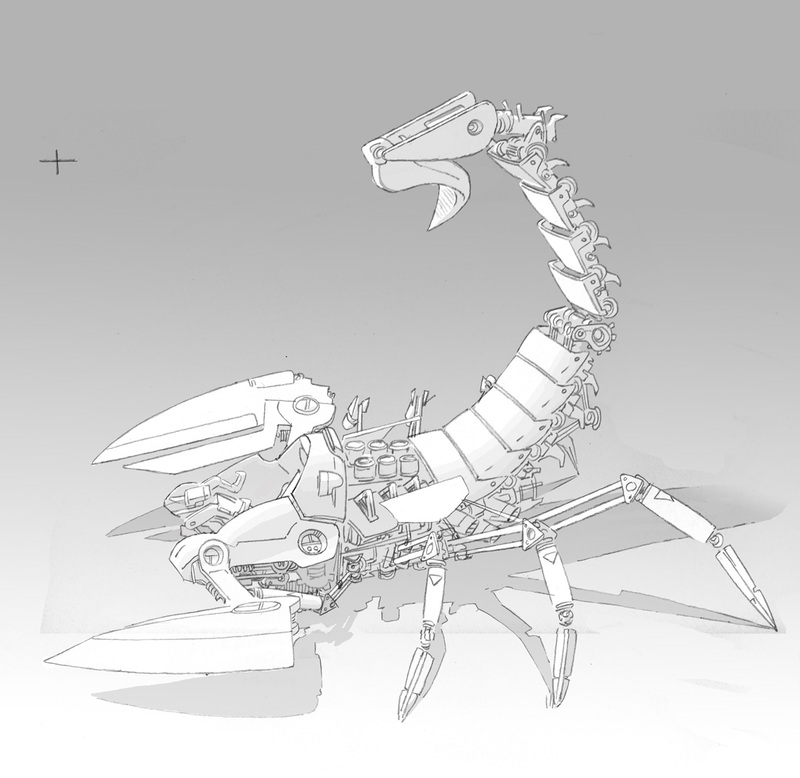 It took many designers and modelers countless rounds of revisions to create the Scorpion mecha, but I hope those of you reading this would agree that the results were well worth the effort. 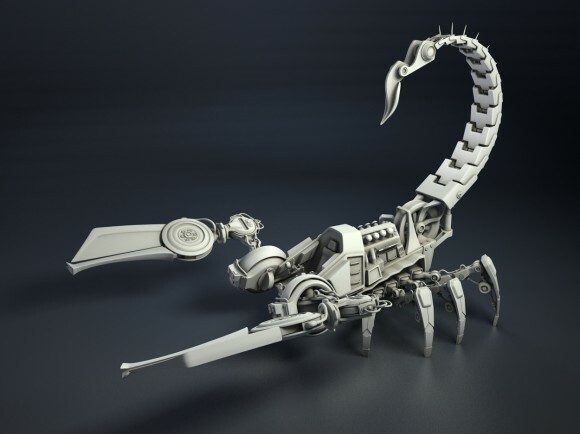 Our Scorpion was finally in 3D form, and it looked pretty neat. But something didn’t feel right. 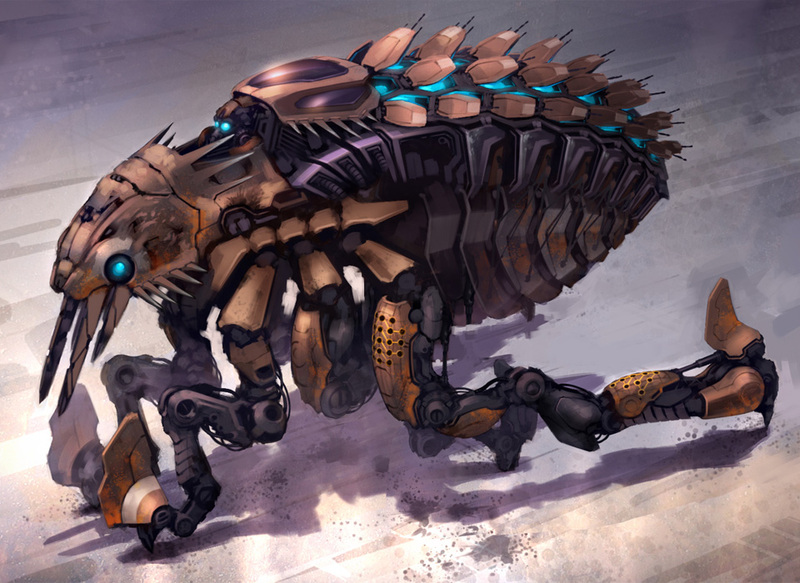 This was supposed to be an unholy offspring of a scorpion and a motorcycle, only it looked more like some sort of mobile vending machine. With a tail. The art director and I determined that there were three areas of improvement we needed to tackle. One of the signature aspects of a motorcycle is the riding position. Our current cockpit looked more like it came from a mini-submarine, or an autogyro. To fix it, we pulled the seat out of the cockpit to work on it in isolation. We studied a ton of motorcycle reference photos, especially the low-rider chopper style popularized by Easy Rider, and after about a dozen rounds of trial-and-error revisions, settled on the design below. We knew we’d have to rebuild a new cockpit shell around it, but the seat was perfect. Insects have a very recognizable body shape and locomotion style. 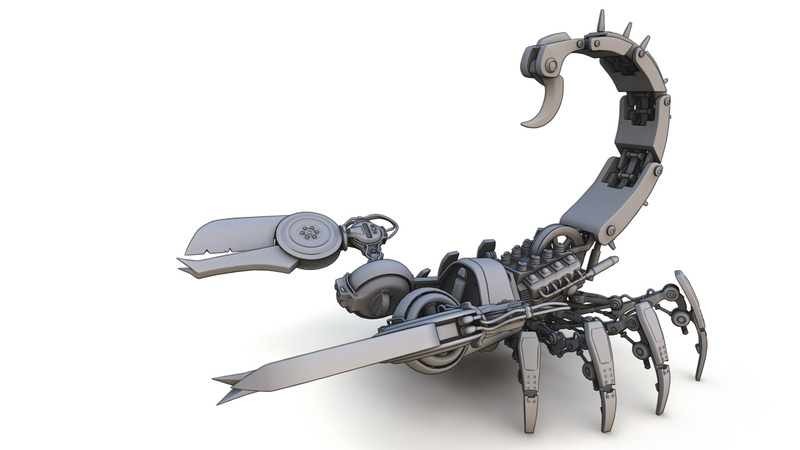 Our current Scorpion model had none of the segmentation that we associate with real-world scorpions, and would probably not scuttle across the ground in an insect-like way. We needed to break the cockpit apart from the main engine/body, and connect the two pieces with a flexible shock-absorbing junction. 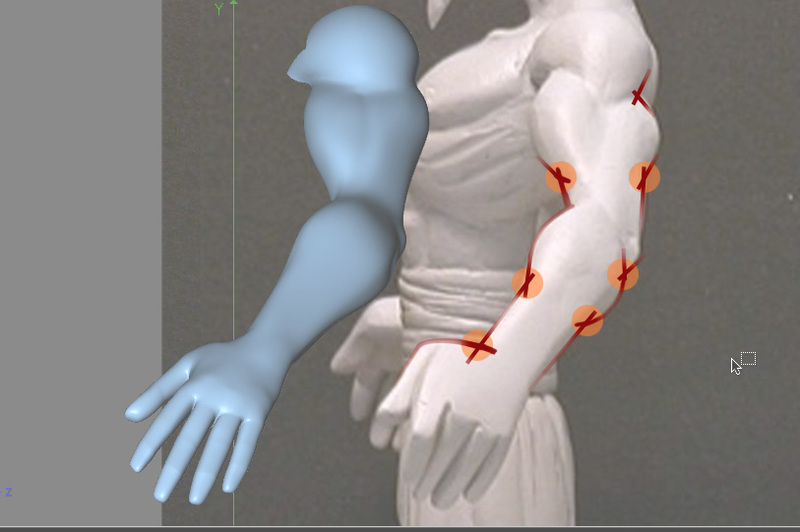 This would allow the two sections to move independently of each other, allowing the animators to create a more unsettling, scorpion-like walking style. 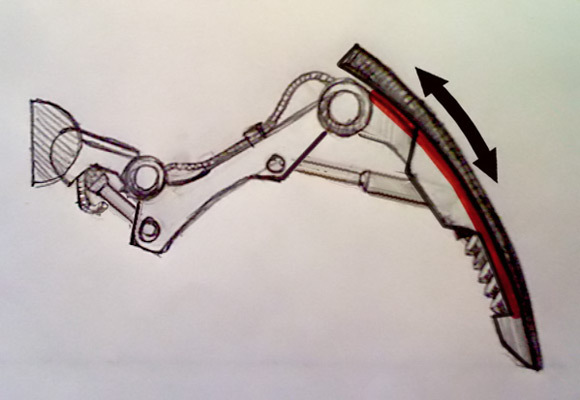 It was a daunting task, creating a junction design that was both powerful enough to support the cockpit and its oversized claws, but with a wide enough range of motion to allow for both lateral and axial movement. 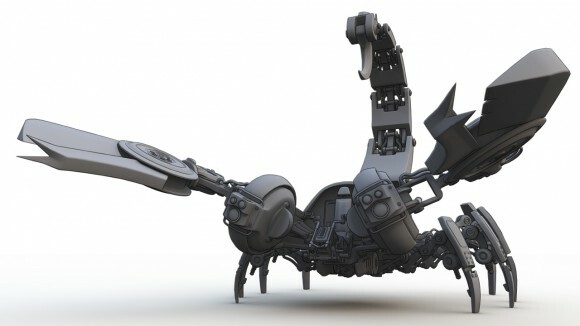 It ended up being one of the last pieces of the Scorpion to be built, due to its complexity. Even now, we’re not entirely sure how we’re going to rig it. 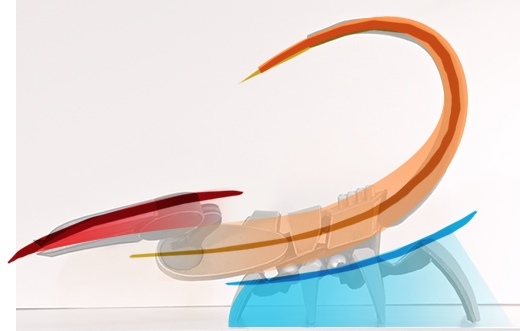 The plated tail design had been introduced in the earliest concept sketches, but over all the revisions it had gotten increasingly slender. By the time it was in 3D form we’d taken to calling it “the watchband.” The art director felt it wasn’t compatible with the heavy, brutal look he was after. So, he went back to his workshop and came back with the most brutal-looking tail design imaginable. The Scorpion design was complete. All that was left was the remodeling. The first thing we did to make the Scorpion more menacing was to beef up the limbs. 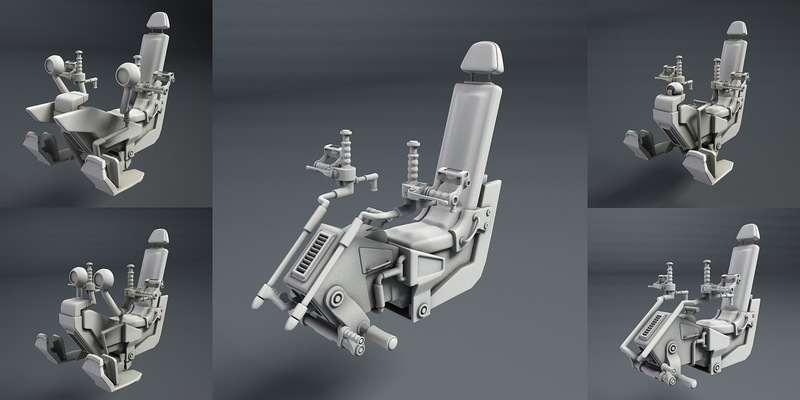 We decided that the legs would consist of a piston-driven set of joints attached to a large shield piece and an integrated shock-absorption system. The claws, rather than oversized shears, would be immense axe-like crushers. Matt updated his cardboard mockup with the new additions. 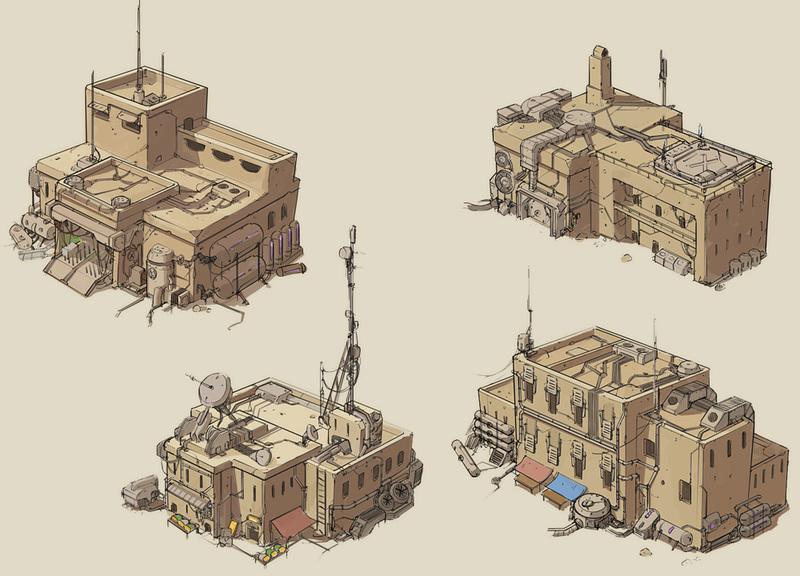 Next, we reached out to Roger Oda, a concept artist specializing in precise, hand-rendered linework. 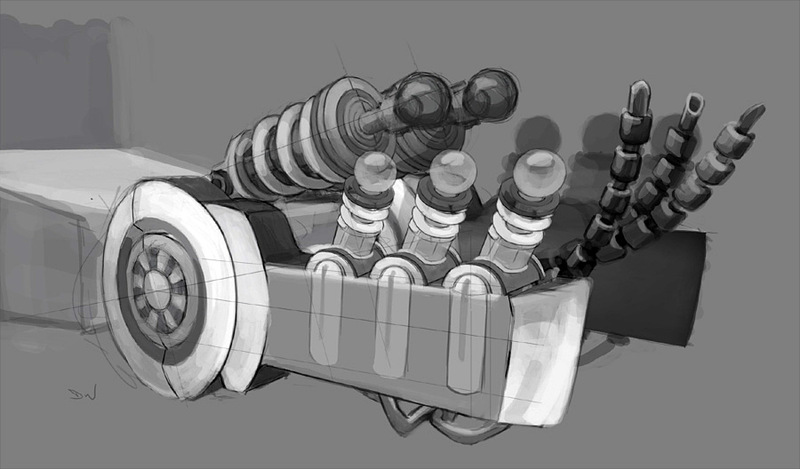 Roger went all-out on the detailing, building up an elaborate structure of pipes, gears, hoses and rotors. 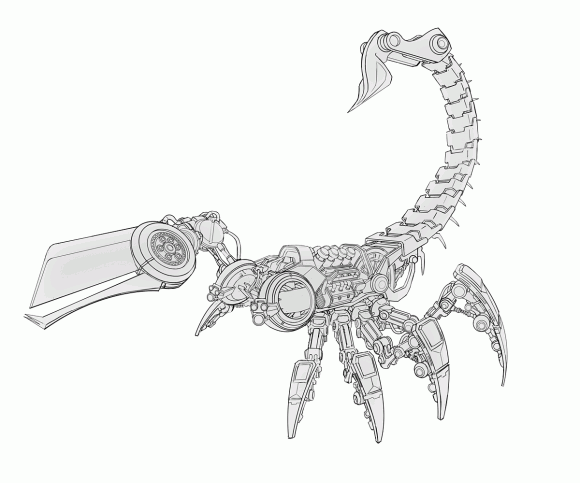 He even introduced a hefty flywheel at the base of the tail, to lend the Scorpion that extra dieselpunk touch. The initial concept for the Scorpion wasn’t much to look at. 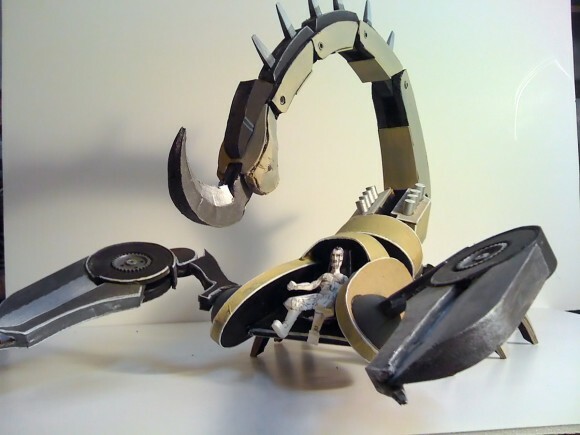 Built by art director Matt Evans out of MDF and wire, it had no legs, cardboard pictures for claws, and a paper clip where the stinger should be. But it established the basic proportions of the beast, and that was enough to get started with. We knew we wanted the Scorpion to ride like a motorcycle—a monstrous, eight-legged motorcycle. We’d given the Rider a cruiser riding position and an exposed chopper-style engine. We just needed someone who could fill in the details and bring the Scorpion to life. Concept artist Dermot Walshe had a whole section of motorcycle art in his portfolio, so we knew he’d be a good fit. Indeed, his take on the Scorpion was a marvel of exhaust pipes, chain gears and springs. He even whipped up an animated “harpoon” attack for the battle scenes! They may not do much besides mill around in the background, but the rival mechanic/pilots in the Tournament are crucial in setting the film’s tone during the opening scenes. Here at Ottoman headquarters, we’re quite fond of the work that’s gone into crafting the “medina” environment—if you scroll up, it’s right there behind the logo. 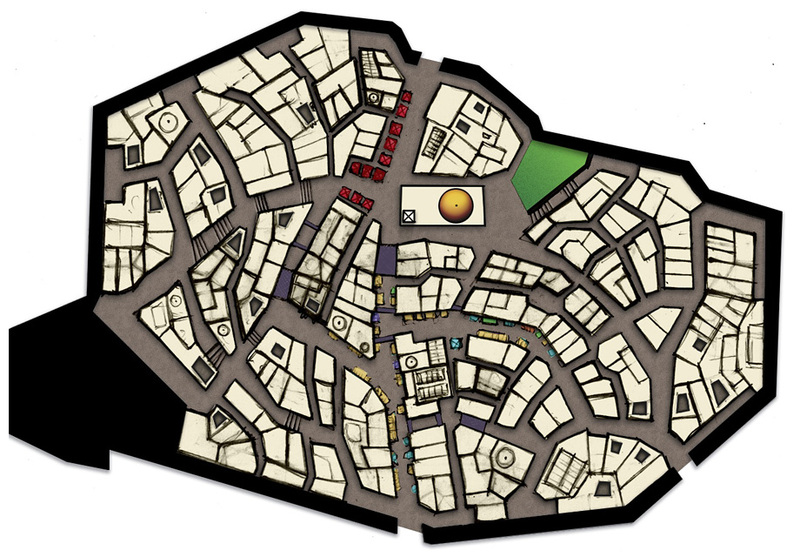 But it is, in the end, just a low-poly mockup of the real thing. The final version is still quite a ways away. 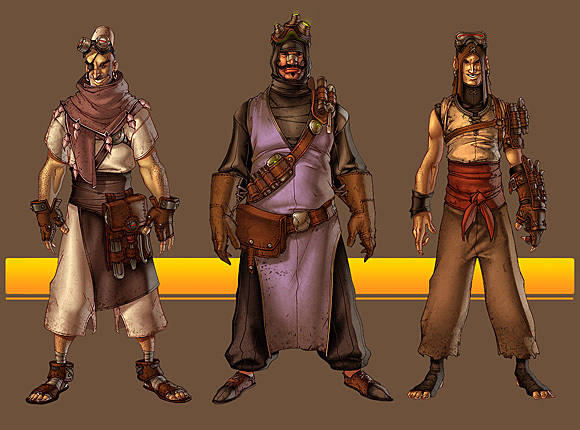 The initial designs for the medina were drawn up by Dimitri Avramoglou back in 2008. 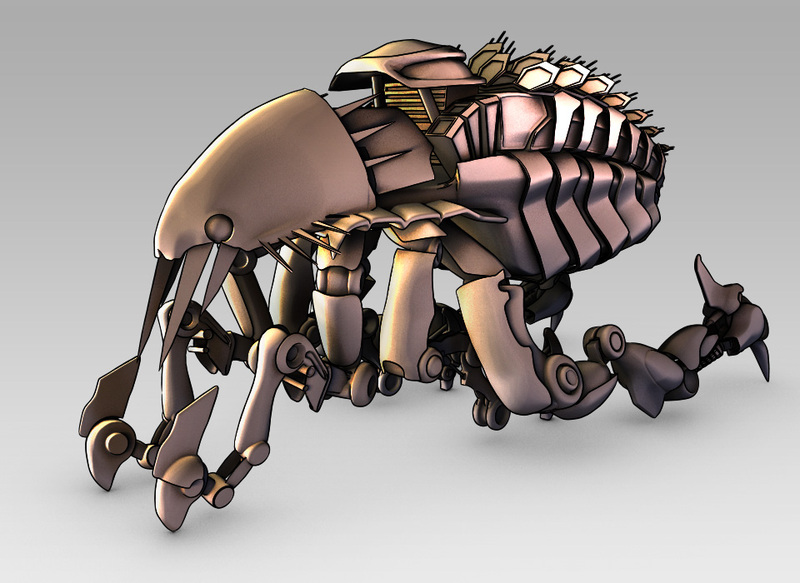 His concepts were later converted into a blocky 3D model which we’ve been using for pre-visualization and tests. As you can see in the image below, the medina features buildings only where the camera can see them. Now that we’re nearing the end of our pre-vis phase, the medina is due for an overhaul. The first step: a library of detailed building designs with which to populate the medina. Some of Tom Woode’s concepts are shown below. 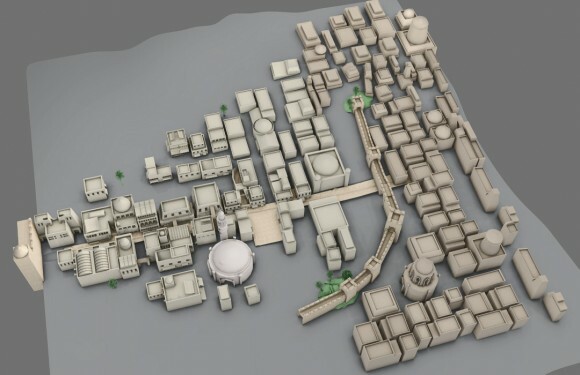 To ensure that these new buildings are laid out as realistically as possible, art director Matt Evans is developing a heavily researched map of the walled city for the modelers to build upon, complete with streets, archways and marketplaces. It’s an impressive start to what is sure to be a massive undertaking. I don’t normally like to post unfinished work here, but these new Scarab mecha “shin guard” designs by Sandi Dolšak are too eye-catching not to share. 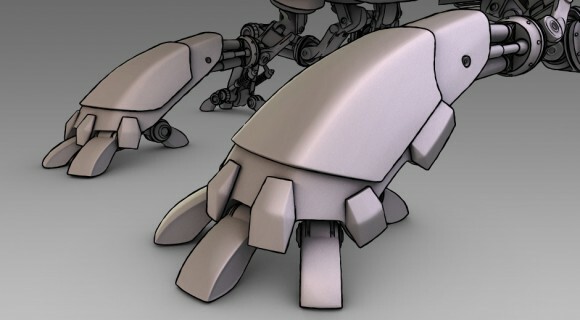 Although loosely based on the 2D concept art, Sandi has added an extra toe, surface plating and some aggressive-looking toe protectors. This model is really shaping up nicely.